Yes its coming up soon! The Lambeth Cyclists Christmas Party – to be held at upstairs at the The Priory Arms, 83 Lansdowne Way, London SW8 2PB on Tuesday 15 December from 7:30pm. You'll have to be there to find out which of the above is not on our list...yet! Come and have a bite to eat & something to drink and celebrate another year of cycle campaigning in Lambeth. Bring friends, partners, flatmates etc etc – the more the merrier. At last two way for Brixton Hil! After more than 10 years of campaigning by Lambeth Cyclists and campaigns by local interest groups and local residents on Sunday 15 November Brixton Hill became two way for traffic. Now when coming South down Brixton Road towards Streatham cyclists will not have to endure the dangerous gyratory system by St Matthews Church (or undertake illegal moves to avoid the gyratory). Instead road users can travel straight ahead from Brixton town centre past the Town Hall and up the hill. Other measures such as the removal of the central railings in Brixton Road, raised crossings and the widening of pavements all aim to slow down the traffic and make the area, the administrative heart of Lambeth, more people friendly. The scheme is part of the Windrush Square regeneration of Brixton centre by Transport for London and Lambeth Borough Council which will be completed in 2010. Our campaign to abolish the gyratory started out with the collection of evidence at a cycle count. This led to the Brixton Triangle report in late 1998 with proposals including abolition of the gyratory. We will be carrying out a similar study in Spring 2010 to gather evidence on the effect of the new road layout. “On a bright crisp morning in October 1998 Lambeth Cyclists volunteers stood around various points of what was then known as the Brixton Triangle, counting and recording the number of cyclists that used the gyratory system. With a ready supply of coffee and pastries, we were helping to get rid of the very cycle-unfriendly one-way system around St Matthew’s Church. As you may have seen on the LCC website and in the South London Press our local cycling charity Wheels for Wellbeing which supports disabled people to cycle was the victim of an arson attack in the middle of October. This resulted in the loss of its stock of bikes, tools and helmets which were stored in a shed in Brockwell Park. Although fully insured, the loss of all cycles means that the regular Friday morning sessions have had to stop for the time being. The charity has been very grateful for the many offers of support. The Brockwell Lido is doing its mid winter swim in aid of Wheels for Wellbeing on 19 December so if you fancy providing some support (and getting cold?) find out more at www.fusion-lifestyle.com/centres/Brockwell_Lido. See www.wheelsforwellbeing.org.uk for further information on the charity. 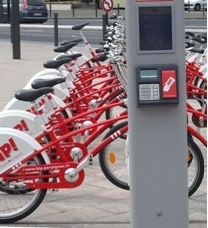 Transport for London’s cycle hire scheme is set to be launched next May (2010) with approximately 6,000 bikes spread over 400 docking stations including 26 located in the North of Lambeth. Last February Lambeth Cyclists attended an exhibition showing the proposed locations and we were unanimous in our feedback on the scheme: whilst welcoming it we felt that sending inexperienced cyclists out onto the main roads around Vauxhall, the Oval and Waterloo was insane - as local residents we had problems negotiating the network of one way streets in the area. Lobbying by Lambeth Cyclists and LCC centrally persuaded the Mayor to fund “associated measures” which would make the area more cycle friendly. One hot June afternoon two of us cycled up and down the streets in the area bounded by Waterloo, Harleyford Road and the river identifying barriers to cycling such as one way streets, no entry signs and curbs that prevent cycle journeys. cycling to create permeability throughout the area is a blue print for similar treatment across the borough. The works will include road resurfacing and other measures so that everyone who cycles in the area will benefit. In addition Lambeth are in the process of submitting bids for an additional £200,000 for cycle training associated with the hire scheme – this is on top of existing training funding. We hope that the cycle hire scheme will be extended southwards into the borough increasing the number of people on bikes and bringing further benefits for all cyclists. manifesto for cycling in Lambeth. drawing up a list of priorities that we would like to see addressed by the new council. by all the political parties in Lambeth reflecting the cross-party support that cycling and sustainable transport has received in the borough. 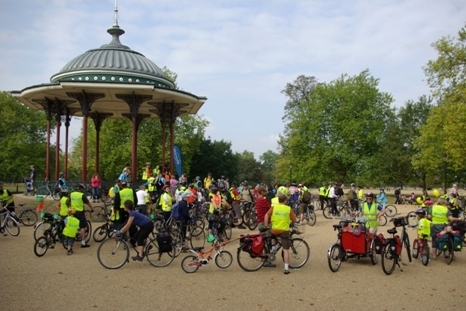 On 20 September 2009 around 500 people gathered at Streatham Hill and Clapham Common to cycle for the Lambeth Cyclists’ led feeder ride to the Mayor of London’s Sky Ride (formerly known as Freewheel). Final preparations are being made for the Lambeth feeder ride to the annual cycling event in central London now known as Skyride (formerly Freewheel). Skyride takes place on Sunday 20 September 2009 – Come and join us for the Skyride. As in previous years we will be running a feeder ride. We will have 3 joining locations in the borough – Streatham Hill, Brixton and Clapham. Everyone, young, old, novice or experienced cyclist is welcome. The ride will be marshalled by the Lambeth cyclists and is designed to enable everyone to have a fun day out along with thousands of other cyclists in central London. 10:40 final pick up at Bandstand on Clapham Common. 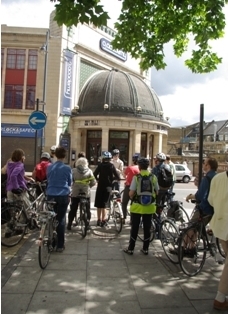 Lambeth is seeking to get an image that conveys the essence of cycling in the borough. They have launched a photography competition and are encouraging all photographers to submit images of “Me and My Bike in Lambeth”. The Council is offering the top prize of £250 to spend on a new bike or other cycle equipment as well as lots of other goodies to the best photos submitted. The Mayor of London Boris Johnson has given the go-ahead for 12 ‘cycle superhighway’ routes which will provide direct, fast routes along the major Transport for London roads (such as the A3, A24 etc) into central London mainly for commuting purposes. Three of the proposed cycle superhighway routes (Kingston- Westminster, South Wimbledon- Bank and Penge-Bank) are set to pass through Lambeth. The Wimbledon to Bank route is set to be launched in May 2010 – one of the first tranche of routes. In preparation for this several members of Lambeth Cyclists have been working with TfL to look at the route through the formal Cycle Route Inspection Meeting (CRIM) process whereby we cycle the proposed route looking for barriers and improvements that could be made. Meet 8:45 Clapham Junction for Saturday. Come and join us either for one day or the whole weekend for an interesting ride through the Sussex countryside around Chichester, the possibility of a trip to the seaside and a visit to interesting medieval buildings. If you come for the whole weekend we’ll be visiting the Pallant Gallery, the Cass Sculpture Park or the sea (depending on riders’ preferences and weather), many medieval buildings at the Downland Museum (and the new Grid Shell Building) as well as a lovely ride through the South Downs. This will be a leisurely ride –approximately 25 miles on Saturday and 40 miles on Sunday but we don't leave people behind. Further details including train times and meeting arrangements are available by contacting Janet Paske (janet.paske@gmail.com/ 07740 457 528). This ride is inspired by the slow food movement and will take in Pimlico Farmers’ market, Clapham Common, Battersea Park, Hyde Park, Green Park and St James Park where we will have a picnic. This will be a slow paced leisurely ride suitable for everyone with a total distance of around 12 miles. Saturday 22 August One-Offs - Architectural Freaks and Fantasies. On this ride we ride will be seeking out buildings that can't be pigeonholed in one architectural style or another and buildings where architectural imagination ran away with itself. So expect the tasteless, the bizarre, the eccentric and the curious. Meeting point to be advertised nearer the time, the ride will last roughly from 10.30 to 4.00. See the website or contact Mark Knox (mpknox@care4free.net/07765 945530) for further details . Bike Week 2009 in Lambeth was as action packed as ever with rides, breakfast and a barbecue. A new feature unveiled this year was our cycle powered sound system which starred at events providing music and provoking interest from passers by. At the start of the week we enjoyed another Bike Breakfast catching people on their way in to work to offer free Dr Bike repairs and give out information on cycling in the borough and events in Bike Week. This event saw the unveioling of our new bike powered sound system, the latest in our set of wheezes to attract the non-cyclists amongst us, - it seemed to go down very well. Thanks again to Lambeth Accord for letting us host the breakfast at 336 Brixton Road. On the Thursday we attended the Lambeth Council run barbecue and Dr Bike session in Ruskin park where our cycle powered sound system (above) gained admiring glances and then at the end of the week we had a ride around “Lambeth’s Greatest Hits”. This ride attracted 27 people, including many newcomers, and visited noteworthy buildings in our own borough which had featured in previous rides. So we viewed a wide range of ages and styles, from the 12th to the 21st century. We took in well-known landmarks like the Broxton Academy (pictured, right), Lambeth Palace and the National Theatre, but also some more obscure delights such as the ex-Necropolis Railway Station, Clapham's hidden Georgian crescent, and some recently-completed eco-council-housing. 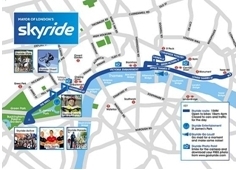 This year’s mass participation Bike Ride in central London has changed its name from Freewheel to Sky Ride reflecting the new sponsor. The event will take place on Sunday 20 September and will again feature large sections of central London which are open solely to bicycles. This year’s ride will be coordinated by British Cycling and will not feature the Cycle Hubs as in previous years – instead of everyone starting off the cycle to central London on Clapham Common there will be a series of led rides from each of the London boroughs. Lambeth Borough Council’s Transport Department are leading the way nationally in working to reduce the road dangers posed to pedestrians and cyclists by lorries and other vehicles. They are implementing a new initiative which addresses the causes of collisions rather than the traditional road safety approach which has the effect of discouraging walking and cycling. Most regular cyclists will know about the blind spot on the side of a lorry, and will position themselves so they are not in danger from left turning vehicles. Lambeth is not only publicising this danger to pedestrians and cyclists but also requiring its lorry drivers and bus drivers to attend safety training and see life through the eyes of a cyclist. This we hope will make the borough’s road safer for all the population. 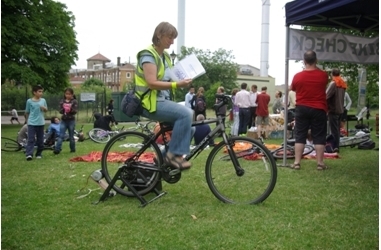 Lambeth Cyclists’ popular series of bike maintenance classes are starting up again in June. Giving a broad introduction to bike maintenance over the course of five weeks these classes will enable you to keep your bike on the road for longer. The classes take place on Tuesdays, 6.30 - 8.30 pm at the offices of Lambeth Accord on Brixton Road, SW9 starting on 23 June 2009. The course of classes are 1st week: general introduction, 2nd week: brakes, 3rd week: gears, 4th week: wheels/tyres and 5th week: general session to fix any particular problems and follow up from previous weeks. They classes are taught by Simon Bendel of Brixton Cycles and cost £55 (or £5 if in receipt of income related benefits) for the full course. Saturday 13 June to Sunday 21 June is Bike Week – the biggest national cycling event which aims to celebrate and encourage cycling. This year’s event focuses on the benefits that can be gained from cycling around our local area. Bike Week rides and other cycling events are taking place across London and the UK. In Lambeth we are putting on various events which complement those being run by Lambeth Borough Council. For further information on Bike Week events see www.bikeweek.org.uk or the LCC website. Join us for our Bike Breakfast at the forecourt of 336 Brixton Road, SW9 between 7:30 & 9:30am/ Call in for information on cycling in London, free coffee & croissants as well as a chance to have your minor bike repairs fixed by Dr Bike. Our regular monthly meeting – we hope to be joined by officers from Lambeth Council’s Transport department to gain an idea of new developments in transport and cycling related policy in the borough and for us to offer constructive feedback. Join us on a short feeder ride to Lambeth Council's Bike Week barbecue in Ruskin Park from either the stone circle near the National Theatre SE1 or from outside the Ritzy, Brixton, alternatively go straight to the event in Ruskin Park. We celebrate Bike Week by selecting some of the most interesting buildings and sites that have featured on our rides over the past four years - and all within the boundaries of Lambeth. There is a whole lot of fascinating and fabulous architecture right on our doorstep so come along & be inspired to stay local! Lunch will be at a park cafe - so bring a picnic if you like - and we'll finish around 4pm. Contact - Mark Knox mpknox@care4free.net / 07765 945530. At our annual meeting in April we heard from Patrick of the transport group of Transition Town Brixton. In a wide ranging presentation Patrick introduced the Transition Town concept and ran through the ways in which Brixton and wider Lambeth could be made more environmentally friendly and less dependent upon oil. In particular he highlighted ways of encouraging cycling and asked for our ideas and suggestions for working together. We will be reviewing the results of the meeting to come up with ways in which we can work with Transition Town Brixton. More information on Transition Town Brixton can be found at www.transitiontownbrixton.org. At the Annual Meeting we also reviewed the past year and elected a new Management Committee to oversee Lambeth Cyclists. Council Liaison: Clare Neely, Rides: Chris James, Membership and newsletter: Luke Evans, Projects: Mike Cavenett, Publicity and external affairs: Charlie Holland. The 2008-2009 Committee were thanked for their hard work. Lambeth Council is consulting on the London cycle hire scheme - in particular, the proposed sites in North Lambeth. Please contact us if you wish to inform the feedback of Lambeth Cyclists to the scheme. Note that the Council's deadline for comments is Friday 6 March 2009, so our deadline needs to be Friday 27th February to ensure all comments are considered. We would like to hear your thoughts anyway!